Continuing with our reputation in customer service, Corbeau allowed its customers to help us design this exceptional seat. 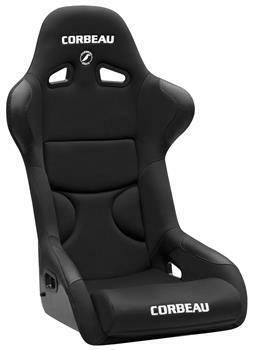 The Corbeau FX1 Pro Racing Seat is the little brother to our FX1 seat. What makes this seat special is its extreme comfort and its ability to fit in almost any vehicle. Based on feedback from our customers we adjusted the width of the seat, added some additional padding, and made this fiberglass seat one of the most comfortable fixed back seats on the market today. Standard features include: fiberglass shell with a black gel coat, removable insert cushions, full body support, 5-point harness capability, and leatherette high wear patches. The FX1 Pro will fit up to a 36 waist.